An article in a local Cambridge publication displayed, upon closer inspection, more than just a rant about electricity costs. The company's bill reveals they were billed $10,199.31 more for December's electricity consumption than they would have if the global adjustment charge was based on December's final class B rate, instead of the 1st estimate it is based on. Bill and Brenda Mechar, owners of Integrated Packaging Films (IPF) are stunned by their monthly hydro bill. Their January energy usage was $12,050.37. However, by the time they paid the debt retirement charges, regulatory charges, Global Adjustment charges and delivery charges, IPF's bill had ballooned to (are you ready for this?)$62,653.34. When you purchase a salad or a meal to-go from someone like a Costco or another food retailer, there is a good chance that IPF created the plastic which made the clam-shell containers in which you carry it home. The firm that was the subject of the article appears to have all their billings based on the first estimate of the global adjustment - the math shows they were billed $76.07/MWh for the global adjustment (which was the 1st estimate for the month), while the final global adjustment was actually a third lower than that at $50.68/MWh. The average cost for the December bill displayed in the article works out to $106.07/MWh. That's higher than the record monthly commodity charge . The estimate also includes a true up to the actual global adjustment for the month before the previous month so that, over time, customers billed on this basis will pay the actual global adjustment cost. Using the consumption history displayed above, the global adjustment rate would come close to averaging out over a 7-month period, but the customer would still be out about $6,000 over that 7 months (compared to a customer charged on the final global adjustment). The first 3 months of 2014 they'll also have been overcharged. This is a good indicator of how disinterested in businesses the Wynne/McGuinty government has been. They've trumped up a billing lottery where the cost of a customer paying bills based on the 1st estimate of the global adjustment, like IPF, has varied over the past 12 months from a low of $23.65/MWh (April 2014), to a high of ~$109.44/MWh (September 2013) - a range of $85.79/MWh. Most electricity costs are fixed in Ontario, so costs don't vary anywhere near that much. Billed on the final global adjustment, the range over the same period is only $17.09/MWh (low of $78.04 in January 2014 and a high of $95.13 a month later). 2. 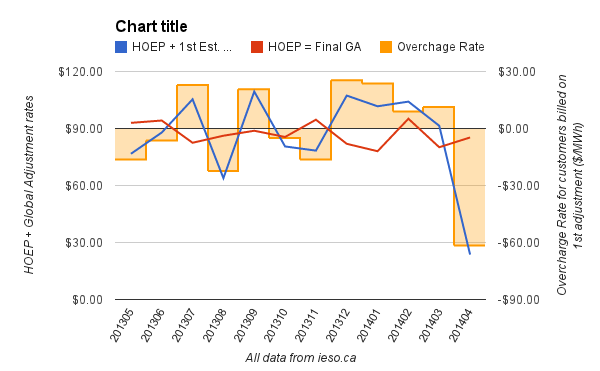 The HOEP average (weighted) for April was $33.30/MWh, and the first estimate of the global adjustment was a credit of $9.65/MWh. 3. Unfortunately the month's final global adjustment is also based significantly on the cost of production months earlier, due to embedded generation and poor systems design/reporting. It isn't surprising the most expensive month in the period is September, because July gets lots of sun and embedded solar is very expensive.